Two incoherent zombie slackers, Mike and Brent, embark on a road trip in search of Mike's old girlfriend and love of his life. But will those nasty bounty-hunting agents with a secret agenda catch them before they can accomplish their mission? Directed by brothers Brett and Drew T. Pierce, DeadHeads wears its influences on its blood splattered sleeve and sees a return to 1980's style comedy-adventure movies like Back to the Future and Goonies. or at least that's what the PR guff assures us. It's pairing of romantic comedy with zombie movie elements prompted Dread Central to describe it as "the perfect date movie for those zombie-loving guys out there paired with a horror-shunning other half," while horror icon Bruce Campbell said of it, "In a world of putrid zombie movies, DeadHeads is a breath of fresh air." We shall see. 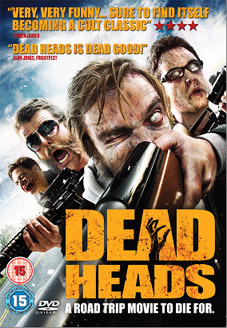 DeadHeads will be released on UK DVD and Blu-ray on 2nd January 2012 by G2 Pictures at the RRP of £15.99 for the DVD and £19.99 for the Blu-ray. If there are any extra features, G2 are keeping quiet about them.